This spacious, space-age geometric dome with en-suite facilities provides modern glamping on a site in South West France. These stylish Domes look like a hybrid between an igloo and The Louvre, with triangular panels crafted into a perfect sphere to create a truly unusual place to stay. Inside, these Domes are well thought out, with a separate living area including 'Fat Boy' bean bags to lounge around on, a master bedroom with a huge King sized bed, and a separate bedroom with two 'hanging' beds for the children. 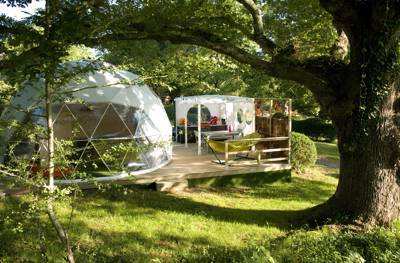 Next to your Dome there is a separate kitchen tent with al fresco dining area, and a 'plancha' (like an express BBQ!) for you to cook your meals on in no time. Shower and toilet facilities are a short walk away. These deluxe domes sleep up to 6 people in total, with a maximum of 4 adults, and comes with its own private toilet and shower facilities, so you don't need to venture far to freshen up after a dip in the on site pool! The location, at Col d'Ibardin campsite, not far from the Spanish border in the South-Western corner of France, is an ideal place for families to chill out and have fun, with two swimming pools, jeu de boules, table tennis, and plenty more besides. A new outdoor playground allows very young ones to slide, climb, jump, and run on soft, forgiving sand. Older children have their own playground, and there's a bouncy castle too during July and August. An on-site cafe-bar and kids club are useful too, for those sunny days when you won;t want to stray too far from the pools. This part of France has the best of both worlds with the Atlantic coast and the Pyrenees on your doorstep, so you won't be short of outdoor options to keep you active. Don't forget to take a trip on the vintage 'Train de la Rhune' which takes you up La Rhune, and once at the top you can stand and admire the amazing Basque Country in all of its glory! The beautiful and bustling towns of Biarritz and St Jean de Luz are both worth a visit, as is hopping over the border into Spain and exploring San Sebastian with its 'seashell' shaped bay and amazing tapas bars. Glisten Camping makes a fantastic base to explore this rich and wonderful part of France, in comfortable, memorable surroundings.